On 21.10.2012 in the "Dunav" hall in Russe was held the National tournament for "Buglaria" cup in Shinkyokushin karate for children up to 10 and 14 years of age. The competition was very strong and in it took part many of the young talents of the Bulgarian Karate Shinkyokushin Federation from clubs of the whole country. The audience witnessed many close and dynamic fights, in which every club's children showed great technical growth, excellent condition and strong will to win. A very strong performance had the competitors of SC "Kyokushin" Shumen with chairman Stoian Obretenov - 2nd dan, winning 5 gold, 2 silver and 1 bronzre medal, as well as first place in team standings for children up to 14 years of age and second in children up to 10 years of age. These defined the Shumen club's youth program as one of the strongest in the country. 1.Ivan Ivanov in the 10 years of age 26kg category, who won his semifinal with avasete ippon after a well placed djodan mawashi geri and in his final convincingly defeated his opponent of SC "Malnia" Haskovo with vazaari. 2.Ioana Terzieva in the 10 years of age 30kg category, who showed great fighting spirit and technical growth in her game in her final against her opponent from Asenovgrad. 3.Dian Petkov in the 14 years of age 39kg category. 4.David Aleksanian, who made an excellent debut in the 14 years of age 45kg category, winning his final with vazaari. 5.Dzhaner Shukri in the 14 years of age 54kg category, who was a class above his opponents and decisively won hsi semifinal with ippon, reaching a knockout by chudan mawashi geri. In his final he defeated a competitor of SC "Tornado" Pazardzhik with avasete ippon. 1.Nesrin Nezhdet in 14 years of age, who won an excellently fought semifinal with ippon and was fouled very bad in the final and could not continue due to doctor's decision. 2.Gunai Galibov in 14 years of age. 1.Barash Dzhelil in 10 yhears of age, who won his third place by vazaari. The competitors of SC "Kyokushin" Shumen could take part in the National "Bulgaria" cup tournament for children up to 10 and 14 years of age thanks to the help of the Municipality of Shumen. Shumen's karatekas continue their preparation for the National "Tornado" cup in Shinkyokushin karate for children up to 12 years of age and juniors, which will be held on 03.11.2012 in Pazardzhik. On 13.10.2012 in the EXPO ARAD INTERNATIONAL CENTER in Arad, Romania was held the European tournament - ROMANIAN OPEN EUROPEAN CUP in Shinkyokushin karate for kadets and seniors. For a consecutive year the competitors of SC "Kyokushin" Shumen made a memorable impression in this great forum. Shumen's karatekas won 3 silver and 3 bronze medals in both age categories. In the kadets 45kg category an excellent debut in international competition was made by Dzaner Shukri, who in his semifinal knocked his opponent out with chudan mawashi geri and in his final was the better fighter, but the refereeing helped only his opponent. In regular time our fighter was a hair away from victory with mawashi or ipon, but the gong saved his adversary. In extra time Dzaner again showed he was better, but the referees decided on an equal match and it went to weight decision, which his opponent won by being 3 kilograms lighter. In the kadets 55kg category Ivelina Petrova made a great performance, showing excellent fighting in her semifinal against her croatian opponent. In her final she faced another bulgarian competitor in the category - Darina Mihova from SC "Kyokushin" Dimitrovgrad and the international experience of Darina helped her against our fighter, who lost by decision. The last silver medal was won by Osman Osman in the seniors 65kg category. 1.Mark Chervenkov in the kadets 70kg category, who in his quarterfinal crushed his opponent, winning with avasete ipon after a very strong low kick, but unfortunately our fighter suffered a heavy injury to his ankle and lost his semifinal by decision to the other bulgarian competitor in the category, Artemii Dobrinin from "Burgas Dojo" Burgas. 2.Dimitar Hadziev in the kadets 65kg category, who made a great debut on the international tatami. 3.Vanio Valchanov in seniors, who fought in very attractive matches. The last debut for Shumen's team was that of Plamen Rusev, who was in the kadets 50kg category and although not winning a medal, he fought very well. He was added to the team late and was forced to lose a lot of weight to make it into his category. Sponsors of Shumen's team for the European tournament ROMANIAN OPEN EUROPEAN CUP were: Municipality of Shumen, Mr. Latif Sali Satif, "Strongstroi" Ltd. with chairman Mr. Niazi Ahmed and "Ultima" Ltd.
Shumen's karatekas heartedly thank their friends for their help, for without it they wouldn't be able to participate in such a strong event. The competitors of SC "Kyokushin" Shumen continue their preparation for the upcoming "Bulgaria" cup for children of to 10 and up to 14 years of age, which will take place on the 21st of October in the "Dunav" hall in Russe. 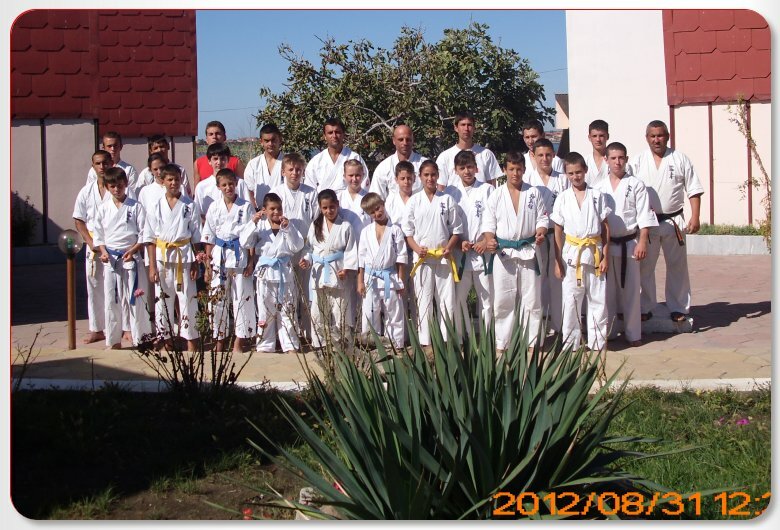 From 29.08.2012 to 02.09.2012 thirty competitors of SC "Kyokushin" Shumen underwent a training camp in Pomorie. Trainings were led in two sessions by senpai Daniel Dimitrov - IInd dan /senior instructor of the club/, senpai Stoian Obretenov - IInd dan /chairman of the club/, senpai Milen Milanov and senpai Aidan Ahmed /instructor in the branch of the club in OU "St. st. Kiril and Methodii" in Tzarev Brod/. The first training session started early in the morning with a lenghty cross run on the sands, then in the main part of training the competitors, divided in the groups, practiced the three components of Shinkyokushin - kihon, kata and kumite. The second training session was for the team of SC "Kyokushin" Shumen that is preparing for the European Cup - ROMANIAN OPEN EUROPEAN CUP, which will take place in the beginning of October in Arad, Romania. It was fully focused on kumite and conditional training. After dinner Shumen's karatekas watched videotapes of international competitions in Shinkyokushin karate. There was ofcourse enough time for beach fun and games, which brought the participants closer together as a group, from the youngest to the oldest. 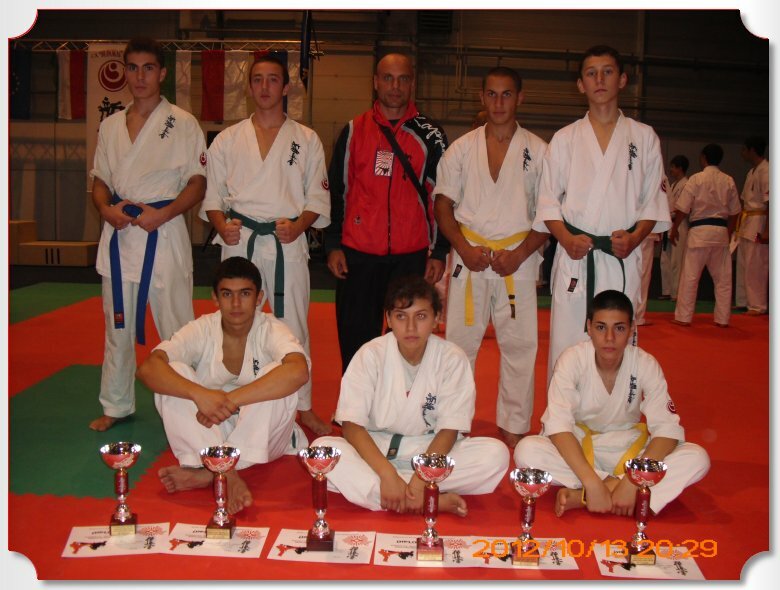 The next event for the competitors of SC "Kyokushin" Shumen will be the training camp for kadets and seniors, which will be held on 08.09.2012 in Novi Pazar. It will be sparring focused and a part of the preparation for the European cup in Romania.